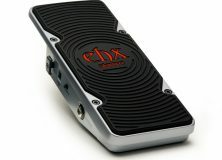 If there is anything Electro-Harmonix has become known for it’s reinventing the functionality of guitar effects pedals. Among their more recent innovations is the 8 Step Program. Here we have a pedal whose role is to automate what your foot is normally in charge of when you use an expression pedal. Describing in text what the 8 Step Program does and how it works is not without its hurdles. Let’s start with the sliders. There are eight sliders on the face of the pedal and each one does the exact same thing. Think of each of the sliders as the expression pedal itself. When you have a slider at the bottom it’s the same as an expression pedal in heel position. When you have a slider at the top it’s the same as an expression in the toe position. When you understand that concept the true potential of the 8 Step Program becomes something much easier to digest. With eight different sliders automatically controlling how an expression pedal angles back and forth you essentially have a programmable foot to do the work for you. Every other feature in the 8 Step Program is designed to flourish the function of the sliders in one way or another, often to thrilling results. 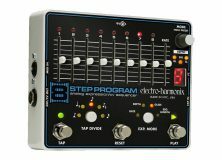 What’s intriguing about the 8 Step Program is just how thoroughly the guys at EHX thought it through. 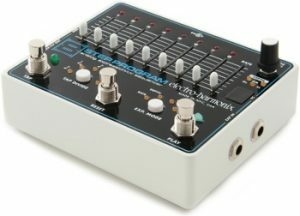 It’s designed to work with guitar pedals, the MIDI input opens the world of keyboards and synthesizers up, and it features forward, reverse, back and forth, and random sequencing from one to all eight bands. 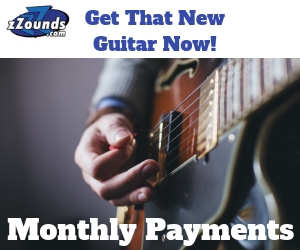 In addition to that you can alter the tempo with a rate slider, the tap divide button, and a tap foot switch. And if that wasn’t enough, this device that acts as a programmable expression pedal can be controlled with an expression pedal. Plugging an expression pedal in can control the rate, the depth, the length of the sequence, or the glide (the amount of time it takes to shift from the setting of one slider to the next one in the sequence). After being in and out of the 8 Step as much as I have recently the only thing I found myself wishing for was more than eight sliders. 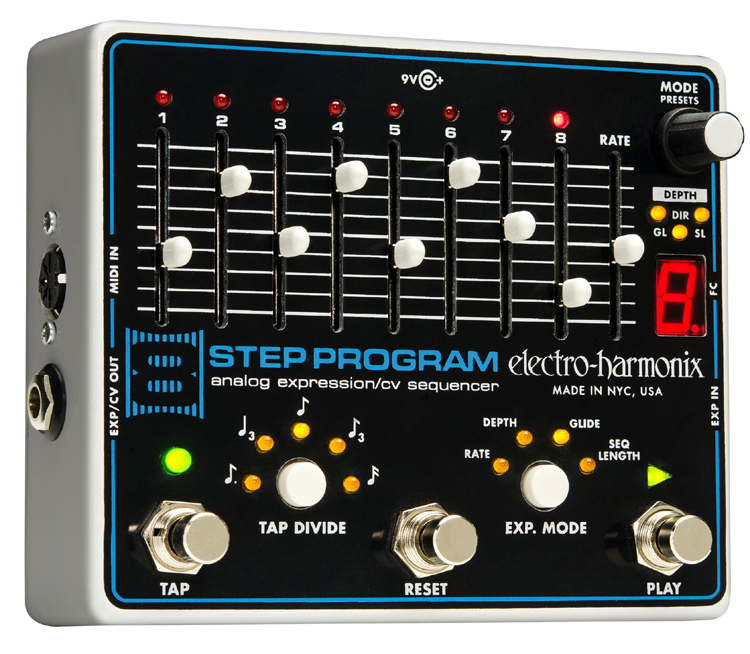 In fact it wouldn’t surprise me if EHX were to eventually release a 16 Step Program… which would be awesome. It’s always something of a personal challenge of mine to see how much I can figure out about a pedal before needing to turn to the instruction manual. The consensus is that you will need the manual. It’s not so much that I found the 8 Step difficult to understand. It’s simply that there are too many features effectively maneuver through and develop an understanding of how to get the sound you’re after from just experimentation alone. For example. When I was playing with the 8 Step I used it with the Hog 2. The Hog having 7 expression modes to work with gave the 8 Step that many flavors to tinker with. My first instinct, after setting the Hog up on Octave Bend was to move the sliders all over the place. After enough tweaking with the sliders plus some cool major harmonies built from the Hog I was able to use the 8 Step to play a variety of chord progressions for me while I strummed an open E in consistent 1/8 notes. I found playing around with the number of steps in a given sequence worked well as I ventured into odd time signatures. Though sometimes it offered some interesting opportunities to be overly mathematical. For instance, a 5 step sequence played in 4/4 set to line up with 1/8 notes while the guitar plays 1/4 notes can give an interesting twist to the feel overall. Though this concept is not a one-size-fits-all idea. When the Hog is set on Freeze+Gliss mode, depending on how I had the 8 Step set it would either work better at sustaining my chords and easing into each chord change or, if I were to turn the glide way down, it would come off as more of a chunky rock organ. Speaking of the glide control – of all the modifiers that alter how a sequence works I bonded with the glide the most. As I’d mentioned above, the glide controls how the 8 Step moves from the setting of one slider to the next and hearing the results for each of the expression modes was seemingly enough to keep me amused on its own. The end result tended to depend on which mode I was running at the time, so there isn’t any all encompassing description on what to expect, but overall you could control how precise the sequence felt in the end. On lower glide settings the sequence felt more spot on with the tempo while the higher settings gave off more of a bleeding effect as the settings sort of warbled and slid from one to the next. 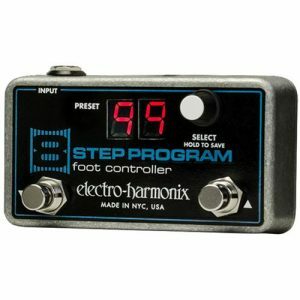 Using an expression pedal to control various parameters of the 8 Step Program offered an interesting new level of depth to the pedal. Controlling how many sliders are active in your sequence on the fly broke free from the evils of hearing too repetitive of a sound, and while I was never good enough to pull it off, I could imagine some people being able to move the sliders around to match changes in time signatures. I, on the other hand, professed in demolishing the sense of rhythm in a whole new way separate from my normal style of playing. 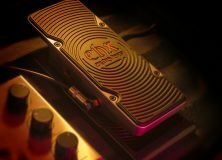 Using the expression pedal to tinker with the rate and depth offered some interesting ideas, but consistent with my thoughts expressed above, it was the glide control that really caught my attention. Controlling how slidey and wobbly, for lack of better say, on the fly was equally instrumental in breaking away from any specific sound for too long. By the time I was all said and done it had me wondering what would happen if I were to plug an 8 Step into this 8 Step. After playing around with the different expression modes I’d found the settings that worked well with one mode didn’t necessarily translate to the other modes. I often chose a wide variety of slider locations with a randomized sequence and the Hog set on Wah Wah, but if I were to keep those settings and switch over to Volume mode or Step Bend the results would be sporadic. Getting the feel for how the 8 Step reacts to the effect it’s manipulating does take a bit of tweaking. As I got the feel for the different modes I did develop some favorite styles. When in Volume mode I often set the sliders to alternate between the top and bottom to get a cool tremolo effect. Step Bend, on the other hand, could get that lush chorus-like warble with the glide and depth set right and some octaves set up on the Hog. The 8 Step Program is a versatile pedal, and sometimes it can take a bit of tweaking to get “that sound”. It can also be easy to lose track of said settings. While the 8 Step does give the elbow room to store 10 presets on board it’s all too easy to come up with more ideas you’d like to hold onto. At that point the optional Foot Controller becomes a triumphant asset. The Foot Controller is as simple to understand as it gets and can save up too 100 settings that can be easily accessed on the fly. 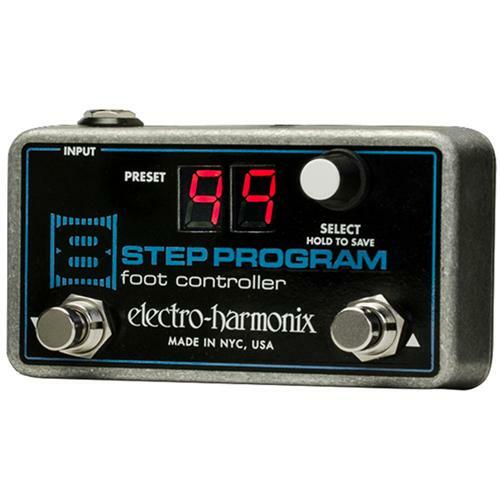 In short the more you do with the 8 Step the more worthwhile it is to invest in the Foot Controller. For navigation purposes you can step scroll through presets with the knob (which doubles as the button used for saving presets) or you can use the two foot switches to scroll up and down. As an added convenience holding either switch down will scroll 10 presets at a time. The biggest setback I can imagine for the 8 Step Program is the fact that it’s not compatible with just any pedal. If the gear you have doesn’t have a CV or Expression input jack then it’s incompatible, so if you’re looking to buy an 8 Step you’ll need to consider what you have first. This is something I stress mostly because a pedal like this has a bit of a steeper learning curve and it would be a real shame if someone were to misunderstand what it does and buy one only to find out the hard way that he/she doesn’t have the compatible gear. Fortunately EHX has a list of verified compatible gear. It’s also worth noting this list is a work in progress. Just because you don’t see a device in this list doesn’t mean it’s incompatible. This list is expanding as the 8 Step is tested with more and more equipment. What you see listed includes verified results to date. Every time I’ve sat down and tinkered with the 8 Step I’ve come up with more and more ideas, and with people out there far my superior in terms of creativity I can only imagine what they would do with a pedal like this. Understanding how it works may be a bit of a challenge at first, but I’ve tinkered with more challenging pedals, and once you get past that this thing is a veritable annihilator of writer’s block. For $123.38 this thing is a steal for the depth it can add to your sound.